I usually post roundups on Friday, but this week I’m at a conference, so I decided to share another free pattern! This crochet scrubby pattern was originally published on the Galler Yarns blog, which is no longer available. I made a few updates and now I’m sharing it here. This textured scrubby is great for washing off dirt or just massaging your face after a long day. I’ve mentioned before that I love using cotton scrubbies and washcloths. They soften after washing in a way that store bought cloths don’t. I prefer using organic cotton for scrubbies and washcloths. (To find out why, you may want to read this guest post on eco-friendly yarns.) Galler Yarns Inca Eco is a favorite organic cotton yarn, and it also uses low impact dyes, so its great for baby projects, too. A set of these scrubbies makes a great baby shower gift, or package several with some special soaps as part of a spa basket for a friend. If you make this pattern, don’t forget to share pictures on Ravelry or on my Facebook page! This textured scrubby is great for removing dirt or massaging your face! 4” (10 cm) across flat edges. Finished Hexagon = 4” (10 cm) across flat edges in pattern. Exact gauge is not critical for this project. 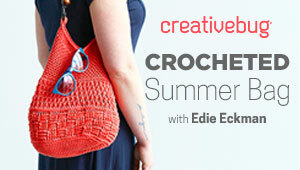 Crochet Essentials: Increase & Decreases, online course with Tamara Kelly on Craftsy! pop – popcorn – 4 dc in same st, remove hook from loop, insert hook from front to back in first dc in group, pick up dropped loop and pull through loop on hook. Ch 6, join with sl st to first ch to form ring. © 2015 by Marie Segares (Underground Crafter). This pattern is for personal use only. You may use the pattern to make unlimited items for yourself, for charity, or to give as gifts. You may sell items you personally make by hand from this pattern. Do not violate Marie’s copyright by distributing this pattern or the photos in any form, including but not limited to scanning, photocopying, emailing, or posting on a website or internet discussion group. If you want to share the pattern, point your friends to this link: http://undergroundcrafter.com/blog/2015/07/15/free-pattern-popcorn-hexagon. Thanks for supporting indie designers! This is really nice. I’d like to try this soon. Thank you for sharing.